"Excellent service, quick and professional "
Read our customers' honest and impartial Land Rover Range Rover Evoque car reviews and ratings to easily find your next car at Motorparks. Stunning car, beautiful interior. The seats, radio and telephones were so easy to set up. Very smooth ride. It's our only car and we both love driving the Evoque. Luxury with practicality. Would recommend to anyone. Excellent car - so impressed by the quality, technology, safety features and of course it's stunning good looks! Wish I had bought it years ago. Beautiful car which drives well. I have a wide range of Landrover vehicles in my family from the Range Rover Autobiography for myself, an Evoque Convertible for my wife and a Discovery Sport Hse Black for my Daughter, not to mention the Discovery Hse which we use on the farm. All of these vehicles are superb for comfort, prestige and reliability. I totally believe there are no other vehicles that can match the landrover brand in off road capabilities and standard safety features. Purchased my Range Rover Evouque Coupe recently from Land Rover Grange Swindon could not be happier with the car and excellent service I received from the whole team at the dealership. I woud highly recommend this particular dealership, having dealt with numerous Land Rover dealerships, these were by far the best, welcoming and professional, didn't feel pressured into anything. The whole experience was quick and professional. Love driving my new car - the experience of driving a Range Rover Evoque is on a different level to your average car. Went for the HSE highest spec, pure luxury, best purchase I've made. If you fancy driving a Range Rover Evoque, go for it, you won't regret it. I love this car! So easy to drive, looks great and feels really safe. I have found that the Evoque Coupé has exceeded my expectations. Aesthetically the design is well thought out and having the black roof with privacy glass positively accentuates the body colour. I deliberately chose the 17 inch wheels to allow the maximum amount of rubber on the road. This [max. rubber] absorbs the pot holes and road surface such that all I need to do is concentrate on driving. The interior of the car is extremely comfortable, the seats are very supportive and when combined with my tyre choice provide a velvet smooth ride. The various systems all integrate very well. The touch screen is very easy to use and all the most frequently used functions are easy to access. The SatNav is intelligent enough to realise that if I go off the original route it needs to calculate a new one not just try and take me back to the original. The build quality is extremely impressive and I feel that the car can handle much more than just day to day driving. I am looking forward to some snow and ice to try it out! The engine responds well to sensible driving and I am getting 400 miles from 10 gallons 46 litres which is quite impressive. Load space is excellent and with the split folding rear seats, more than I will ever need. Overall I am very impressed and will certainly buy again my wife and daughter are looking to purchase as well. This is British engineering and design at its best. We had an amazing customer experience at Grange and that helped us to finally decided to purchase the car. Our Evoque is mint new, even if it's a 2013 model, the build quality is astonishing and the design has kept up with the years very well. Will totally recommend Range Rover to anyone thinking of buying a car. Am really enjoying driving my new vehicle. So glad I chose the Range Rover over a Mercedes Gla. Am delighted with the service provided at Land Rover Welwyn. Just bought a Range Rover Evoque from Welwyn and am very pleased - it drives great and has lots of extras. Would recommend one - feel very safe driving it. This is the first time I have owned a Range Rover Evoque. It looks really stylish but responds even better than it looks. I can't believe how many features and luxuries this car has - I'm finding new ones every day! I can't recommend this car enough, so versatile. I love my new car - it is so prestige and has everything to make driving it so easy - especially the rear parking sensor. I am really pleased with our new Evoque and the more I read the manual I find there are extra things it has on it that I hadn't expected to be on there - so an extra bonus. Fantastic car to drive, very pleased with the purchase of this quality vehicle. Really happy with my new car. Beginning to get the hang of all the modern technology involved with the whole driving experience, but despite being shown in great detail at the test drive, I need to have an IT lesson to get to grips with some of it. Love the seamless gear changes of an automatic after having always had manual cars, also how responsive the car is if you need a little power surge. The car was beautifully presented upon collection. If only it stayed so shiny without washing! The Evoque Dynamic is a stunning looking car inside and out and boasts a host of extra features that make driving this vehicle an absolute pleasure. This is the second Evoque I have owned and I can honestly say it's the best car I have ever owned. My advice is to test drive an Evoque you will not be disappointed. When my husband and I were looking for a compact SUV car and browsed between brands such as Audi, BMW and Land Rover, we immediately realized that there is no comparison! The elegance, the quality, the options available, the drive experience, you name it! We are in love with our Evoque and happy with our investment. It's true when they say that once you have experienced it there is no returning back! Bought an Evoque on a whim, went into the Land Rover showroom and asked which vehicle I should have? That was the one question - a few questions from the salesperson and a ten minute test drive I had made up my mind, and not regretted it one second. Although pre-loved, it is suprising how may people envy you driving this around and wish they could afford one. It's not a review of engine, space and speed I know, as most people will give you that information and it can be seen on YouTube. This a just honest down to earth letting you know how I find it. I had an Huyndai i10 before, soon got used to the Evoque, a short few miles and I was away. The size didn't matter at all. A few lights popped up unexpectedly but that's the thing with modern cars, it's run with a computer on board. Would I recommend it? Of course I would. Stylish, smooth and fast on the road - economical in fuel. I purchased a RR Evoque SE Tech Auto on contract hire. The car is lovley and comfortable to drive. It has been a dream to own a RR and it is a reality. The boot is slightly smaller than I thought for my needs and the fuel economy is also less than I anticipated, but I am happy to put up with that. It is easy to park and manoeuvre the streets of London. Great looking car on my drive. The Range Rover Evoque is everything it promises to be. Elegant styling mixed with comfort and performance. The 180bhp diesel is no slouch and the 9 speed automatic gearbox is seamless through the transitions. The Land Rover app to build your own spec really helps in determining what suits you and your pocket. This is my second Evoque and I look forward to the next 3 years of motoring. This is my first SUV and I really love it, previously owned a Jaguar XF, so infotainment system familiar. Like the driving position. Love the car. Love the car, very comfortable a pleasure to drive! Very nice drive, very well built and good features with voice control SAT NAV. We love it !! Everything about it feels luxury, the drive, the seating, pure comfort we have never had a car that feels so safe and comfortable and fun all at the same time. 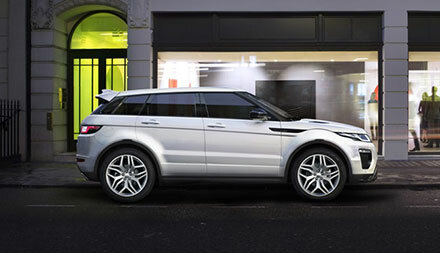 At Grange Land Rover Car Dealers, we guarantee you will get the best price possible on your used Range Rover Evoque. Visit us today at Grange Land Rover Barnet, Grange Land Rover Swindon and Grange Land Rover Welwyn.